THE REVIEW: Breaking Bad is easily my favorite television show to have graced the air within the past decade. The story of Walter White (Bryan Cranston), chemistry teacher turned meth cook, is so gripping at every turn and gets you addicted almost as if Breaking Bad is some kind of methamphetamine itself. Of course, one of the great characters on Breaking Bad is Saul Goodman (Bob Odenkirk), the lawyer of the criminal crowd in Albuquerque, New Mexico. To say I was excited for a spinoff show would be an understatement and I greatly looked forward to Saul Goodman’s origin story. 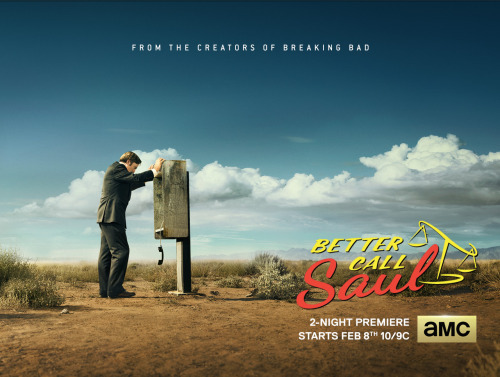 However, I was a bit skeptical that Vince Gilligan (creator of both shows, Peter Gould is a co-creator of Better Call Saul) could strike gold twice. After watching the final episode of season one, I can safely say Better Call Saul lives up to its predecessor. As with my reviews for other television shows, I look at the season as a whole instead of each individual episode. For episode recaps, I enjoy reading Allison Keene’s over at Collider (here are links to her recaps for the first and last episodes, “Uno” and “Marco”). For me, the main reason Better Call Saul succeeds as a spinoff is because it respects Breaking Bad but doesn’t tie itself to what came before. A lot of the visual style and technical choices (cinematography, settings, music choices, editing) are clearly inspired by, and sometimes copies of, what we saw and heard in Breaking Bad. That is more than OK; in fact I welcome it with open arms. Keeping the visual style and certain storytelling techniques consistent between the shows helps solidify the link between the shows. Think of it like a brother and sister: both shows are from the same family and look alike, but the characteristics of each differs. Season one follows Jimmy McGill — aka “Slippin’ Jimmy” — in the days before he becomes Saul Goodman. His past is that of a scam artist who went too far once too many times and had to be rescued by his older brother, Chuck (Michael McKean). Afterwards Jimmy starts down the path of justice, passes the bar exam, and becomes a lawyer only to be shut-down by the firm H.H.M., of which Chuck is a key partner. Struggling to make ends meet Jimmy takes the dregs at the bottom of the barrel: public defense work (like teenagers decapitating a corpse), impossible cases (like Betsy and Craig Kettleman), and elderly clients (a bunch of wills and BINGO nights). Better Call Saul is about struggling to do the right thing versus taking the easy way out. Many times Jimmy is presented with the easy option (taking the Kettleman’s money, accepting the buyout from H.H.M. for the Sandpiper Crossing case) but every time he takes the high road. He’s trying to make his life better and get as far away from his Slippin’ Jimmy persona, the scam-artist and con-man, as he possibly can. Knowing that Jimmy McGill eventually becomes Slippin’ Jimmy again in the form of Saul Goodman gives this series a catharsis that would otherwise be impossible. We know how the struggle ends up which is what makes it much more difficult to watch. We want Jimmy to remain Jimmy McGill, Esq. and not the greedy, fraudulent Saul Goodman. THE TAKEAWAY: Bottom line is that Better Call Saul comes out with guns blazing in season one. For Breaking Bad fans, this spinoff respects the source material while also taking it in some bold new directions. Jimmy McGill is not the Saul Goodman we knew in Breaking Bad, and while his struggle is similar to the struggle Walter White goes through as he becomes Heisenberg, Jimmy’s struggle is in many ways harder and more difficult to process. The continuation in visual style and several cameos — including Tuco Salamanca (Raymond Cruz) — pays homage to Breaking Bad and are welcome additions. Even for people new to this universe of characters and were probably confused by the series opener at a Cinnabon in Omaha, Nebraska, Better Call Saul will rope you in and get you hooked quickly. If not be the end of the premiere episode “Uno”, then certainly by the second episode “Mijo”. Season two cannot come soon enough.